This afternoon, the BCS visited Clematis nursery J. van Zoest B.V. in Boskoop, represented by (from left to right) Alex, Sylvia, Beryl, Denise, William and Pamela. After a great supper and stroll about in Gouda they left for the hotel to travel further tomorrow for the Clematis Festival this Saturday. It was a very good day. 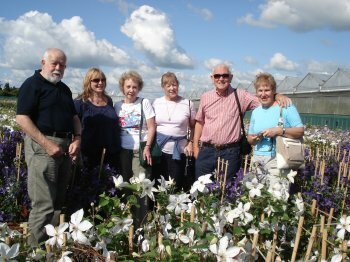 About 670 visitors and the nurseries had some new Clematis in the collection. Even 'aromatica' and fruticosa were available. It was a pleasure to have the 6 persons of the BCS at the festival, thank you.